It took me nearly a year (my hair grows so slowly)to grow out my blonde hair to this point where I can finally call it ombre hair. But I still get a lot of strange reactions when I tell people I actually like my dark roots after their advice to visit a hairdresser to re-dye my hair. well, i can understand you! it looks amazing! Haha Hollanders snappen dat niet.. Ik vind het prachtig bij je! Ik ben zelf heel licht, en vind het vaak niet zo mooi om het ombre te laten verven (dus eerst donker maken en dan een soort fake uitgroei creeeren). Ik heb dit ook! Alleen is het bij mij al halverwege en is het iets meer geleidelijker aan het overlopen! ignore the strange reactions! u look great! 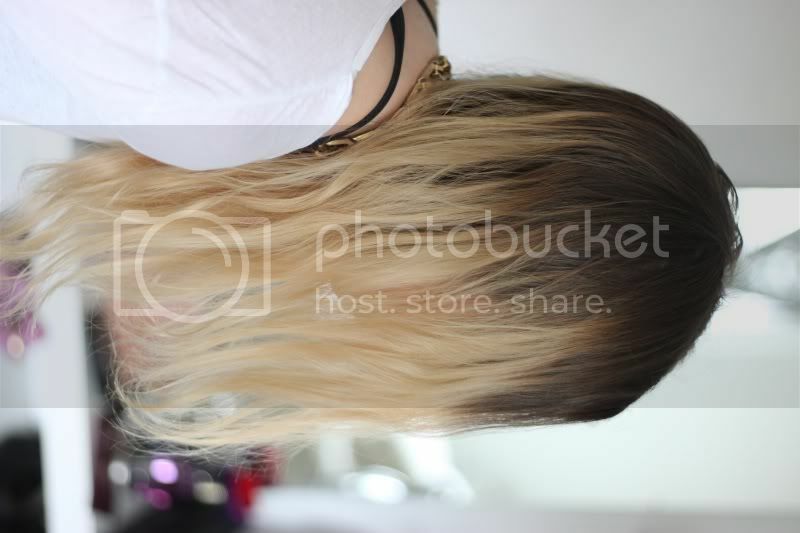 urgh, I dont understand why people don't like long dark roots... It's look so more natural and so bohem! Ik vind dit wel leuk staan eigenlijk, ik zag toen ook die zeikreacties op girlscene over je kapsel, mensen begrijpen het niet:P Ik vind leuk en niet trashy staan! ik vind het jou echt prachtig staan! die zeurende hollanders, haha. I LOVE it! Makes me want to dye my hair blond to copy you... haha! i tried to do ombre my hair but i wasnt that good:)) love your result:) love ombre!!! Het staat je echt geweldig! GREAT ! i love ombre hair. Lol...looks good...AND you know what you real color is..perfect! It looks really good. Mine grew out naturally too, then I dyed my hair brown and I hated it so I had it dyed back ombre. I absolutely LOVE Ombre hair!! It looks gorgeous! haha, don't listen to your hair dresser! ombre hair looks great on you! I think your style is very beautiful!! And you are very beautiful,too. It looks great! Im going to my hairdresser today to do it! Im so scared! Hahah! M.
I think your hair is amazing... I was always wondering about how do you keep it up this way... it always looks great. I thought it was totally intentional! I like it :) Looks great! 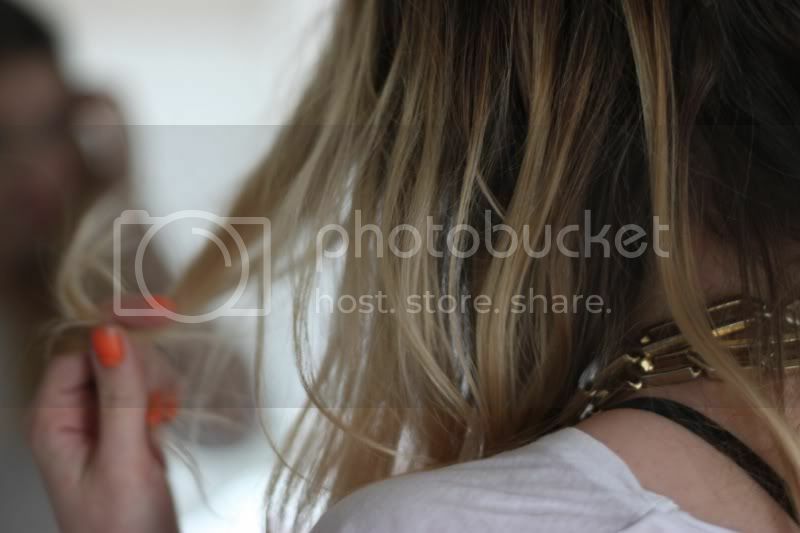 I have something similar going on at the moment, only inverted - lighter roots - black hair. Was considering a trip to the salon to fix that, but after seeing these photos I've had a change of heart on the matter. Don't redye it! It looks good like that. love your hair!! thanks for your comment...you have an amazing blog and it's always a pleasure to visit it with a lot of attention! helemaal mee eens meid! houde zo...:)! Definitely loving the way it looks. Zegt weer wat over je uniekheid. yess, looks great on you! Haha, ik vind het juist supermooi! I love how your hair looks like this!! same thing goes for me! ps. really really really really like the pink lips on you. Your hair looks great :) I'm a new visitor to your blog - can't wait to read more entries. Have a great Sunday! Your hair looks lovely! This is a good length for balayage. haha, I actually fake my ombre hair, I've bleached the ends..
Wauw! ziet er cool uit. Idd niks aantrekken van die mensen die het niet begrijpen ;-) Ik ben je gaan volgen! Jij mij ook?.. I adore your hair, it's perfect! 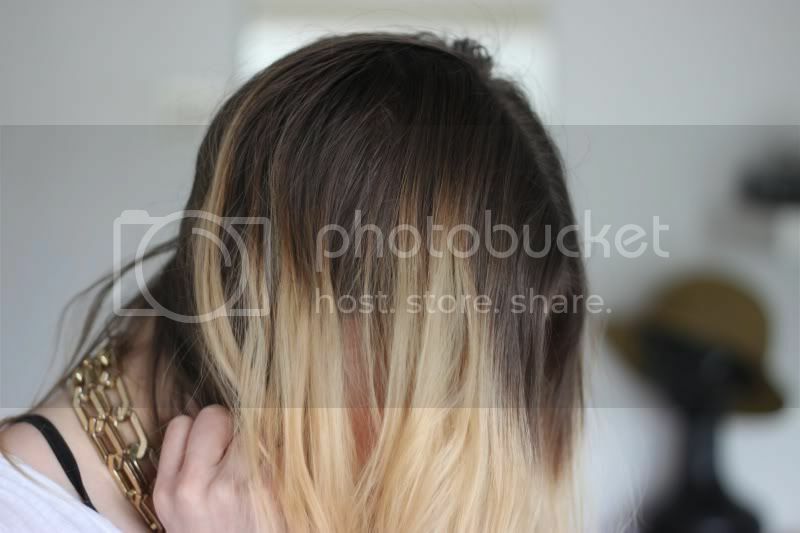 I wish my hair could pull off the whole ombre look as nicely as yours does. This is my hair now too, and yep - all my friends are telling me to fix it up but I'm starting to like it! yeah man...i love it. don't dye it. come check out a pic from our lalaland gypsy shoot we did! vintage from it to be on the site soon! and follow to get a 20% discount!! I think it would look so much better if you didn't have the ends bleach blond. Your roots are too dark so it doesn't blend nice. I bet if you dyed them to maybe 2 shades darker or so it would look more natural. The way it was intended. Thanks for your honest opinion anonymous. But I actually intended it to be a bit unnatural, I like the neglected look. Love the orange nailpolish ! !